Party makeup, it’s not a big deal. I’m sorry for ones expected a fabulous thing. There is no ‘skill’ in today’s posting. I feel a bit worried. I have been taking skin infection treatment for weeks. The word infection… means acne. My face gets worse according to foods or the amount I take. so I couldn’t but go to a hospital. People who have acne may know… scar appears on the spot. When the infection is severe this level, do not squeeze it at home. Even in case you go to hospital, you should tell doctor about it very well. Nurses’ treatment don’t make it go away. ‘Laser pressing’ can make the acne disappear. Actually, I didn’t know anything about it. I told the doctor about it and he gave this treatment to me. Doctor does it himself. It little bit painful but it’s better than squeezing. It feels like all my nerves gathers in one spot. 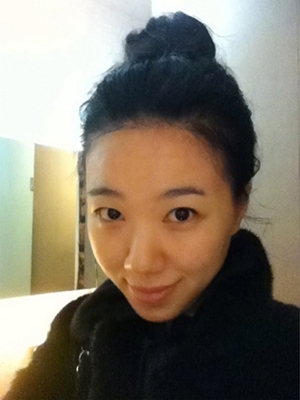 After the laser treatment, all my acne went away without any scar. If you have immortal ace, consider laser treatment. Laser treatment doesn’t have any bad effect on daily life, but as I am taking other treatments, so I don’t do a makeup these days. Well, doctor also said not to do a makeup. A woman may want to do a party makeup that day. 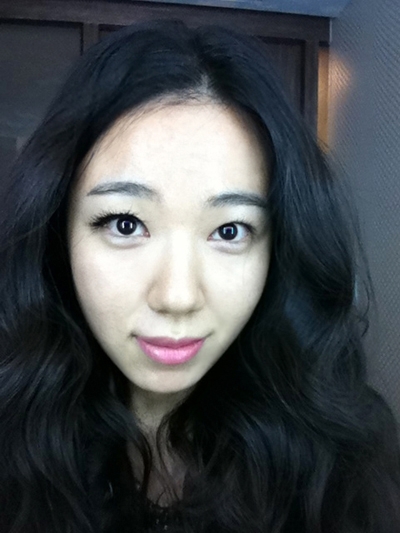 I wanted to… but as my skin condition is not good..
'Sound Black'and colored lip with Mac lip gloss. Les CeCi Mini size lip gloss of Mac Holiday, I didn’t apply anything else. Luckily, the flash hid my scar. Dressing up fancy is not a essential thing for party. Natural skin with glossy feeling is attractive enough. I just wanted to add more impact…. I just decided to use artificial eyelashes. I bought it before and I have just been kept it…because I didn’t have the chance to use it. I decided to try this one. It is made of peacock fur and it’s originally different from existing Eyeme eyelashes. 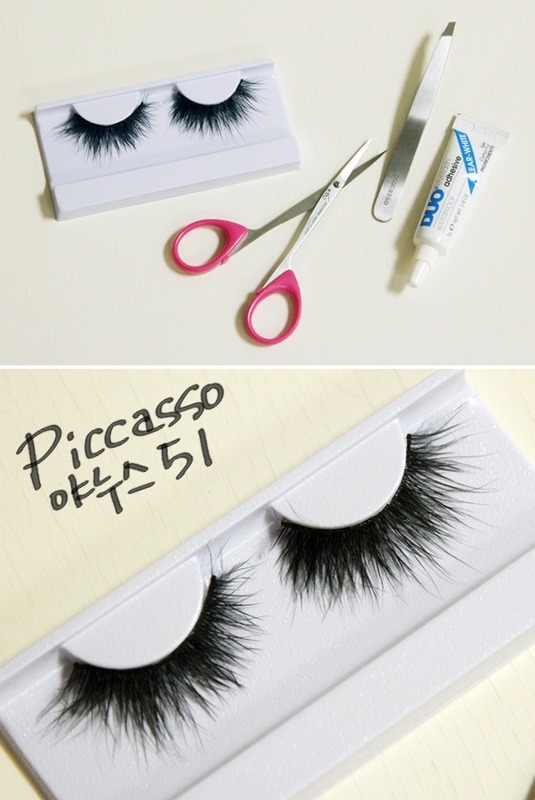 Eyeme eyelashes are similar to human eyelashes but this is thicker. But as you see in picture, things like black feather are attached on it. The reason I chose this is that the feather has a smudge effect. For example, compared with special #30 of Piccasso Eyeme line, the one female idol singers use most is no. S30, but S3 is real plentiful and long. So even it’s a party, it can be look exaggerated in places except for flashes. I wanted to express fancy eyelashes, but it makes eyelashes too powerful. but it doesn’t make a show girl look(I don’t intend to offend show girls). It’s picture of me with the eyelash on one eye. It looks funny, but it’s for show you the difference. You can regulate the length by cutting them little bit. Of course, as I said last time, you can add artificial eyelashes or maximize it. But I used duo glue blue. I attached them all. Like the right picture. One more good point of Janus #51 is that it expresses cool eye line. It’s best to attach these after finishing the makeup, but you can do this first. Applying eye shadow after that makes you another person, easily and quickly. I wanted to add huge pearls on eyes, but I decided to be satisfied with it. It’s ok even if you can’t draw eye line. If you attach eyelashes this way. You’ve got to be flexible in makeup. In fact, you might do things good or bad without recognizing. Of course, learning basic is the most important thing. Everything stays still and the non-makeup face stays still. Well, if you like exaggerated makeup like the picture on the right side, I have nothing to say. It’s not my style. But… I am a lady… Sometimes I feel like walking street with this makeup. I didn’t think of posting it at first. Not at all. so I decided to post it. Before the eyelashes attached enough, the face was somewhat rigid. But I couldn’t stop it. It’s so a famous red lipstick. I like the color red and its classical feeling, but I don’t use it often because it’s matt. But the color is very attractive. I erased the pink lip gloss on my lip and I applied red lip stick on it. 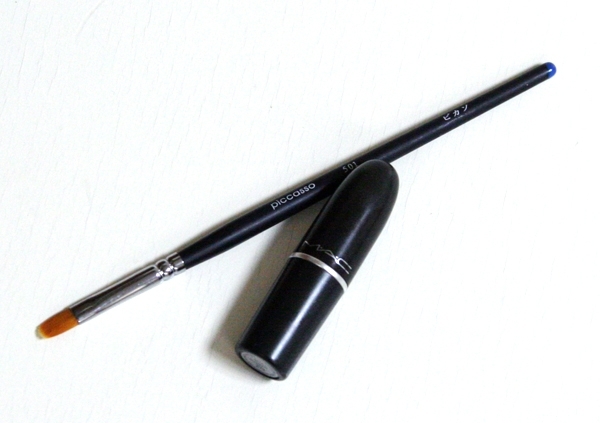 I applied the inside and trimmed the lip line with the left of the brush. My friend asked me if my concept is a witch. I explained that I just attached artificial eyelashes and applied lip stick…and they were shocked. 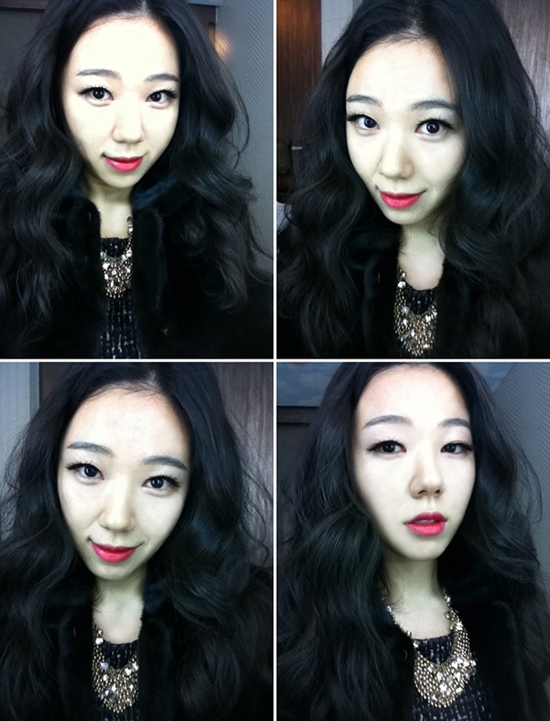 It’s a party makeup on my style from unavoidable reasons…. 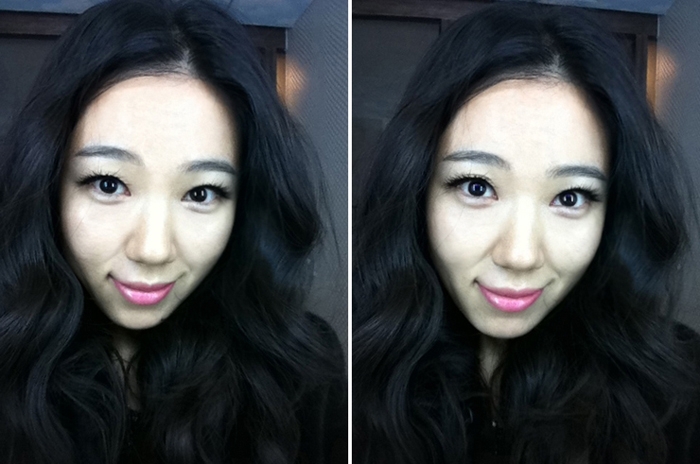 It’s good to make up step by step from skin makeup. Let’s find perfect makeup for our own life style. It’s fun. Anyway, many weren’t satisfied by my face, but I was. 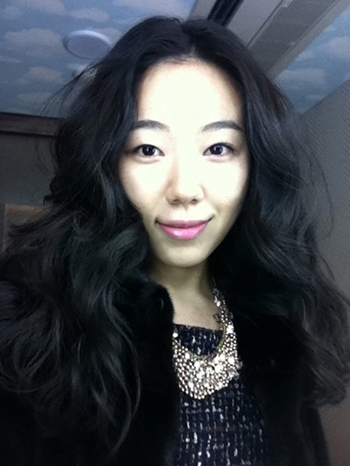 Above all, I like the light face without makeup. I feel sorry to show you my picture with no eyebrow makeup. But please understand that it’s because many requested this. I don’t want to be hurt. but it was not that serious. but I started corrected the hair line to let my forelock grow. Anyway, the M shape is gone and the boundary went away. I told you that bluish hair root disappears, right? but the hair dresser in the shop let my forelock fall on my forehead when drying. But when I dry them at home, hairs don’t go down. It doesn’t become this natural with one treatment. Several treatments lead to this hair line. One surprising point is that my family members didn’t recognize it. It seems very natural. I removed the jutting pat of M shape. Doctor recommended not to adjust to the hollow part, so I followed his advice. But I couldn’t help the thin hair on hollow part. As I trimmed the middle part, I should plant hairs on hollow part. So when I let my hair down, the side is covered so it’s not a problem. My forehead looks little fat in the picture…. When I started hair planting, a famous actress H did it too. I was surprised at picture of her showing her incomplete forehead. but I’m very satisfied because my treatment seems to have been done better than hers.